I never ventured to attempt many photos in the hot daylight sun of Italy; however, as the sun dropped down behind the cliffs of Positano in early evening…the lighting on the picturesque Amalfi village brought out the depth of color and highlighted the plush vegetation. Around 5:00pm, I positioned the camera at the edge of the opposing cliff to frame this image allowing the colors to derive their true spectrum of light and power. 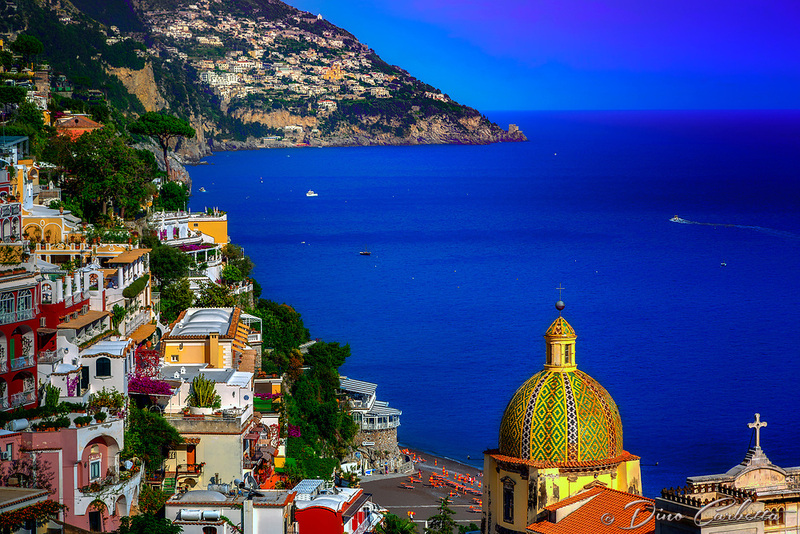 The focal point of most views of Positano is the church of Santa Maria Assunta. The colorful dome is made of majolica tiles which are very prominent on the Amalfi Coast, and the church contains a thirteenth-century Byzantine icon of the legendary Black Madonna.